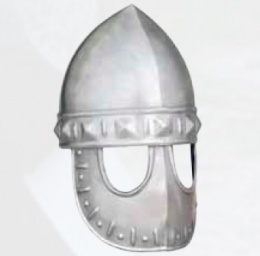 The usual Norman helm is similar to a spangenhelm, featuring a skull-cap and a nasal guard. That design is expanded on in this Masked Norman Helmet, though, featuring not a straight nasal guard, but instead, a full face mask for protection! Tasteful embossments enhance the look. This page was last modified on 26 October 2013, at 19:12.